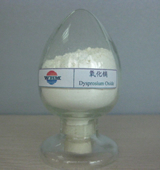 Dysprosium, atomic no. : 66, symbol as Dy, weight at 162.50, is most commonly used as in neodymium-iron-boron high strength permanent magnets. While it has one of the highest magnetic moments of any of the rare earths (10.6uB), this has not resulted in an ability to perform on its own as a practical alternative to neodymium compositions. It is however now an essential additive in NdFeB production. It is also used in special ceramic compositions based on BaTiO formulations. Recent research has examined the use of dysprosium in dysprosium-iron-garnet (DyFeG) and silicon implanted with dysprosium and holmium to form donor centers.